An interactive point-of-view presentation tells the story of Acurian. Acurian, a clinical trial recruitment agency, provides numerous services that benefit all parties involved in a clinical trial. 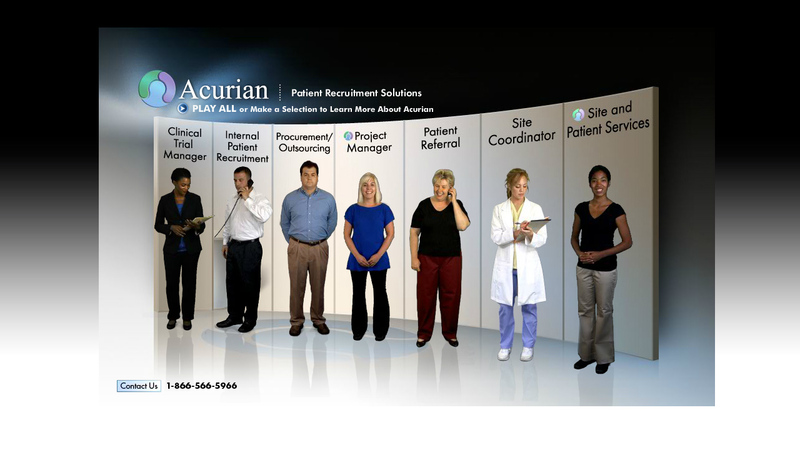 From the Clinical Trial Manager and On-site Coordinators to the patient, Acurian streamlines and expedites the recruitment effort with an approach to service that is people-focused, process-oriented, and performance-driven. To tell the story of Acurian and highlight their industry-leading services, DDA created a point-of-view presentation video featuring not one, but seven actors. In development of this video, DDA sought to complement Acurian’s established corporate identity. The scripts and visuals were crafted to present the complete story of Acurian, effectively explaining who they are, what they do, and what makes them different. The video was to be used at tradeshows, hosted on Acurian’s corporate website, and formatted on DVD for dissemination as a promotional handout. DDA therefore paid special attention to versatility, ensuring the end product was an effective one regardless of format, method of delivery, or targeted audience. To showcase Acurian’s start-to-finish service offering, DDA wrote seven scripts relaying the viewpoints of individuals involved in the clinical trial recruitment process. Using this unique point-of-view format, audiences learn why Acurian is the best fit for their recruitment efforts. In production of the Acurian video, DDA developed a highly stylized illustrated environment. Within, actors interact with screenshots, background images, charts, and custom graphics to reinforce pivotal script points. The DDA-developed graphical user interface (GUI) makes video navigation a cinch with intuitive features and functionality. Users have the choice to watch all videos in sequence or pick and choose the character perspective most relevant to their focus and need. Years after its initial release, the Acurian point-of-view video presentation is still in use today. Whether used at a tradeshow or disseminated as a promotional hand-out, the viewer reaction is always the same: recognition of Acurian as a reliable, results-driven organization committed to delivering clinical trial recruitment success.